Users of traffic simulation models, such as CORSIM, must conduct multiple runs for each scenario included in the analysis in order to generate statistically valid results. Multiple runs reduce the possibility of reaching erroneous conclusions, caused largely due to the randomness in how simulation models generate key parameters. The number of runs of simulation model depends on the scenario being evaluated and the level of accuracy required in the analysis. However, even with a small number of runs, the burden on the user to make these runs manually can be very significant. CORSIM uses seed values (random numbers) that influence how various parameters and probabilities are calculated. In order to get statistically representative results for the same scenario, the CORSIM model is run several times using a unique seed value for each run. 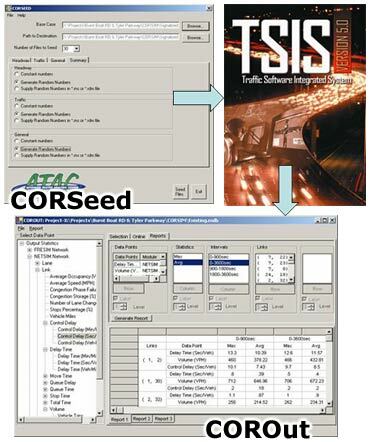 CORSeed is a windows-based software tool developed by ATAC to facilitate multiple runs of CORSIM. CORSeed has a user-friendly interface which allows the user to conduct as many as 100 runs with one batch. CORSeed can also generate unique random seeds to be used with each run automatically, but users have the option of supplying their own seed values. The routine generates case .TRF files, a TSIS Script file, a TSIS Project file, and a text file that records the random seed values used. COROut is a software tool developed by ATAC to facilitate extracting the desired values from CORSIM output files. CORSIM users currently have to search through extensive output generated by CORSIM after each run to find the data they need. COROut has been developed to ease the extracting process from the CORSIM output files. It is a standalone program that compiles the CORSIM output from multiple runs and allows the user to easily browse through data and generate reports. The data is compiled and statistics are generated allowing the user to easily compare multiple scenarios, time periods or even investigate interval data. CORSeed and COROut together can make your analysis more accurate and save you time & money. Note: CORTools 5.1.2 fully incorporates the movement specific statistics module and the time period duration limits.